Product code: ES7230 Categories: Sold Items, Sold Rings. With such an incredible design, this diamond ring from the Art Deco era sits perfectly on the finger and is destined to always be admired. When a ring is hand made compared to mass produced and cast made as many rings are today, you are able to get such intricate and fine detail as can be seen here in this ring and thanks also to the use of platinum which has the ability to be drawn into such a fine wire and still able to retain all the strength needed to secure the diamonds. The the centre is an early brilliant cut diamond that measures 0.58 carats, and on top and below is another early brilliant cut diamond that totals 0.80 carats. These three diamonds are exquisitely millgrain set with an open work design to allow the skin tone to show through adding so much more character to the ring. Millgrain setting is the elegant and fine crimping along the edge of the setting which was typical of jewellery of the Art Deco period. And then to highlight this gorgeous ring further, is more pierce work reminiscent of a scroll work design, further highlighted with twenty single cut diamonds that total 0.32 carats and add some lovely sparkle to the ring. 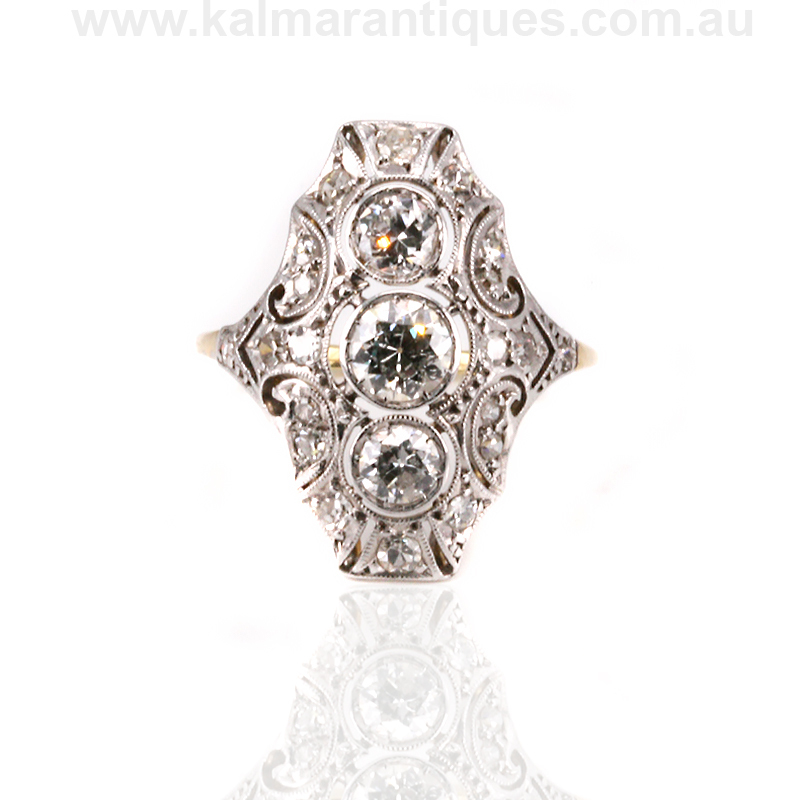 With the amount of diamonds, this ring really stands out and is sure to be appreciated and admired day or night. Measuring 17.6mm across by 22.4mm, the way this ring contours to the finger really beautifully and accentuates the finger so elegantly and no matter what finger it is worn on will certainly feel so special. This is such an incredible and elegant Art Deco diamond ring that has such incredible detail and sparkle from the diamonds and one that you will fall in love with. 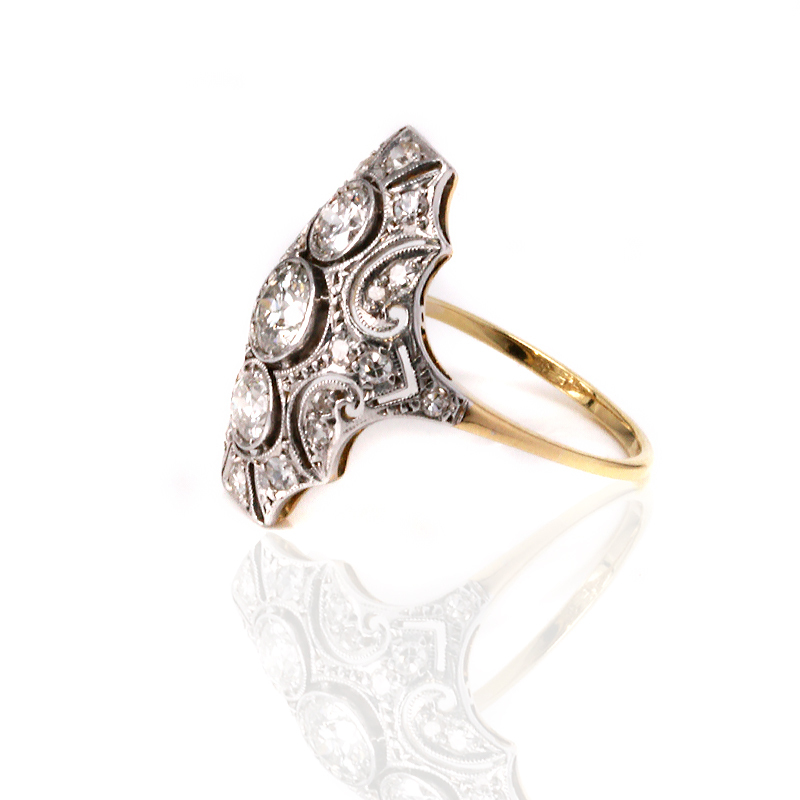 Tag: Art Deco Diamond Ring.